The tragic destruction of the space shuttle Columbia 10 years ago today (Feb. 1) taught NASA and the nation a tough lesson: Despite the strides that have been made over the years, human spaceflight remains a dangerous proposition. Columbia broke apart upon re-entering Earth's atmosphere on Feb. 1, 2003, destroying the orbiter and killing all seven astronauts on board. The accident jolted NASA out of a complacency that had developed in the 17 years since the other major shuttle disaster, the 1986 disintegration of Challenger shortly after liftoff, experts say. 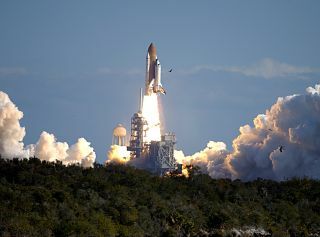 Columbia blasted off for the final time on Jan. 16, 2003, carrying more than 80 scientific experiments on a 16-day research mission known as STS-107. Though Columbia roared into space successfully that day, it suffered a mortal wound during liftoff. A chunk of foam broke off the orbiter's external fuel tank and struck the leading edge of Columbia's left wing, punching a hole in the shuttle's protective heat shield. When Columbia tried to come home on Feb. 1, 2003, hot atmospheric gases infiltrated the wing through this weak spot, causing the orbiter to break apart high over Texas. All seven STS-107 astronauts — commander Rick Husband, pilot Willie McCool and mission specialists Michael Anderson, Kalpana Chawla, David Brown, Laurel Clark and Ilan Ramon, who was Israel's first spaceflyer — were lost. The Columbia accident also led to the end of the space shuttle program, whose end was announced in 2004 and finally became official in July 2011. NASA will honor the memories of the Columbia astronauts, as well as those killed in the agency's two other spaceflight disasters — the Challenger accident, which also claimed seven lives, and the 1967 Apollo fire, which killed three — today during a Day of Remembrance ceremony. You can watch the NASA ceremony on SPACE.com here beginning at 10 a.m. EST (1500 GMT). "NASA's Day of Remembrance honors members of the NASA family who lost their lives while furthering the cause of exploration and discovery," agency officials wrote in a statement. "Flags across the agency will be flown at half-staff in their memory." In the early days of the shuttle program, the vehicle's advocates claimed it would make human spaceflight routine, taking much of the risk and cost out of the endeavor. The long run of success after the Challenger tragedy led some within NASA to buy into this notion, Hale said. But the Columbia accident once again drove home the dangers of spaceflight — the tremendous energies required to lift a vehicle into orbit, for example, and the inhospitable environment far from Earth's surface. "Space exporation is a very difficult business," Hale said. "You cannot ever assume that you've got it down to a regular travel system like an airline or a bus or something. It's just that much more difficult and takes a great deal of attention to detail." NASA, other national space agencies and private spaceflight companies are working hard to make spaceflight as safe as possible. But as with many activities — driving a car, for example — the dangers can only ever be minimized and managed, not eliminated. "I think there always will be risk in going to space," Dustin Gohmert, NASA Crew Survival Engineering Team Lead at Johnson Space Center, told SPACE.com. "I think it's an inherently risky endeavor." SPACE.com assistant managing editor Clara Moskowitz (@ClaraMoskowitz) contributed to this story. Follow SPACE.com senior writer Mike Wall on Twitter @michaeldwall or SPACE.com @Spacedotcom. We're also on Facebook and Google+.